Surendar tossed away the paper and rushed to the scene; he could no longer ignore his wife's call. His only daughter Tejaswi was looking rather scared and tears were welling up in her eyes. A bowl filled to its brim with green salad was in front of her. to eat the salad which she detests. Tejaswi was a nice child, quite an intelligent eight-year-old. Like most kids her age, she simply detested green salads. But Surendar's mother and wife were not willing to allow her to be choosy about her food. Surendar cleared his throat, and picked up the bowl. "Teju darling, why don't you take just a few spoons of the salad? For Dad's sake dear!" Tejaswi softened a bit, and wiped her tears with the back of her hands. Tejaswi agrees to eat the salad on being promised that her wish will be granted. her father realizes that he must keep his promise. "No, Dad. I do not want anything expensive". Slowly and with difficulty, Tejaswi finished eating the whole quantity of salad. Surendar was inwardly angry with his wife and mother for forcing his child to eat something she so strongly disliked. After the ordeal was through, Tejaswi came to Surendar with her eyes wide with expectation. "Atrocious!" shouted Surendar's wife, "A girl child having her head shaved off? Impossible!" "Never in our family!" Surendar's mother rasped and muttered, "She has been watching too much of television. Our culture is getting totally spoiled with these TV programs!" "Dad, you saw how difficult it was for me to eat that green salad". becomes a lesson for everyone. Tejaswi got her head clean-shaven and her eyes looked even bigger and more beautiful. The following Monday morning, Surendar dropped Tejaswi at school. As she proceeded towards her classroom, she turned around and waved to him. He managed to wave back with a smile. Just then, a boy alighted from a car, and shouted, "Tejaswi, please wait for me!" What struck Surendar at that moment was the clean-shaven head of the boy. “Maybe, this is the trend nowadays,” he thought. Girish could not attend school for the whole of last month. He lost all his hair due to the side effects of the chemotherapy. He refused to come back to school, fearing the unintentional but cruel teasing of the schoolmates. Friends, let us remind ourselves of the fact that the happiest people in the world are not those who live on their own terms but those who change their terms for the ones they love. Life is short and transient, but they alone live who live for others; the rest are more dead than alive. The tender hearts of children are so pure, untainted, and blemishless. The good virtues that reside in their hearts manifest in so many ways. What little Tejaswi did in our story is a classic example of sacrifice for the sake of another. It is said that the child is the father of man. Indeed! How often we judge children for their acts, but later discover their noble intentions. There are countless instances in Baba’s life where He taught the importance of compassion. Once, during a prize distribution ceremony for the children of the primary school in Prasanthi Nilayam, one boy’s name was called out. And it so happened that two boys had the same name in that class! 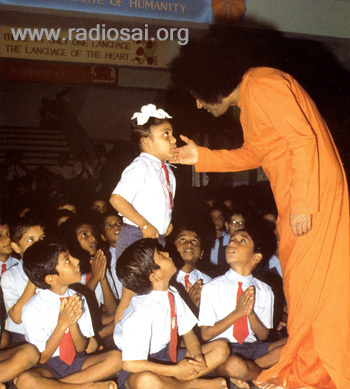 The boy who was to receive the prize didn’t get up right away and so, the other classmates started nudging the second boy — “See, there is nobody going, so you go!” Innocently, the boy got up and went up to Swami. But by then, the first boy who was to receive the prize had already gone to Swami, received his prize, and returned. Hence when the second boy went up to Swami, he was highly embarrassed! There was no prize left to receive. He realized that Swami had already given the prize. So he ran to the edge of the hall and started crying. Swami noticed this boy's tears and called him. He made the child sit on His lap, and taking His own handkerchief, wiped his tears. He asked the warden to get some prize for the child and then personally gave it to the little one! What a spontaneous identification with the small child's embarrassment and what an outpouring of love! When Baba Himself could find time to cheer up a small child, can’t we do small acts to cheer up those who’re having a bad day or going through some trauma? Do reflect on this and we’re sure you’ll find the answer!